China has unveiled its first firm target for limiting greenhouse gas emissions, two weeks before a global summit on climate change in Copenhagen. Beijing said it would aim to reduce its "carbon intensity" by 40-45% by the year 2020, compared with 2005 levels. Carbon intensity, China's preferred measurement, is the amount of carbon dioxide emitted for each unit of GDP. But our correspondent says it does not mean China's overall levels of carbon dioxide will start falling. Its economy is still growing and is mostly fuelled by polluting coal, says the BBC's Quentin Sommerville in Beijing. It will be at least a couple of decades before China's emissions peak, so it is likely to remain the largest polluter for some time to come, he adds. But greenhouse gas emissions in China have not been rising as fast as its economy has been growing. The Copenhagen UN summit - between 7-18 December - aims to draw up a treaty to succeed the 1997 Kyoto Protocol, although observers say this is unlikely. The 40-45% target for cutting carbon intensity is ambitious - more ambitious than many observers had expected. But it doesn't mean China's emissions will fall - in fact they are still likely to rise, with the rate at which economic growth rises outstripping the rate at which carbon intensity falls. This is exactly the kind of plan that major developing countries were supposed to take to the Copenhagen summit. Coming on the heels of President Obama's decision to put numbers on the table for cutting US emissions, it is likely to make discussions in Copenhagen a lot more straightforward. But whether developing countries are impressed by the size of the US commitment is another matter. Beijing also said on Thursday that Chinese Prime Minister Wen Jiabao would attend the talks. That confirmation came a day after US President Barack Obama said he would go to the summit. 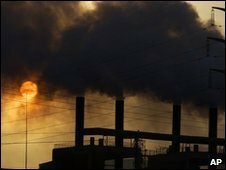 The US - the second largest polluter after China - said President Obama would offer to cut US emissions by 17% from 2005 levels by 2020. But the offer was less than hoped for by the EU, Japan and UN scientists - most other countries' targets are given in comparison with 1990 figures. BBC environment correspondent Richard Black says that on that basis the US figure amounts to just a few percentage points, as its emissions have risen by about 15% since 1990. This is much less than the EU's pledge of a 20% cut over the same period, or a 30% cut if there is a global deal; and much less than the 25-40% figure that developing countries are demanding. President Obama's offer reflects figures in a bill narrowly passed by the House of Representatives in June, but yet to be confirmed by the Senate. He will arrive at the summit after it opens and will not stay until the end, when delegates hope to stitch together a deal. While in Europe, he will also collect his Nobel Peace Prize in Oslo. Thursday's announcement by China marks the first time it has issued numerical targets for plans to curb the growth of greenhouse gas emissions. A statement from Beijing's State Council, or cabinet, said: "This is a voluntary action taken by the Chinese government based on its own national conditions and is a major contribution to the global effort in tackling climate change," Xinhua news agency reported. Our Beijing correspondent says this is a commitment to make Chinese factories and power plants use fuel more efficiently and get better results. China is showing that it wants to play a leading role in tackling global climate change, he adds. It has already made a pledge to increase its renewable energy targets to grow more forests and develop green industries. Yang Ailun, Greenpeace China's climate campaign manager, told AFP news agency: "This is definitely a very positive step China is taking, but we think China can do more than this."